More "oldies but goodies" added to our growing list! The abacus is a calculating tool that has been used for centuries. The traditionally designed abacus has beads or counters that move back-and-forth on columns with virtually no resistance. This allows for the device to be used for calculating with great speed, but does not lend itself well towards use by a person who is blind or visually impaired. The Cranmer Abacus is a 13-rod abacus which has been adapted specifically for users who are blind so that it may be ready tactually. It has a red felt backing which prevents the beads from slipping. The frame of this abacus measures 6 1/8 x 3 1/4 inches and the bead diameter is 3/8 inch. Several manuals and guidebooks are available to assist students in learning how to use this valuable tool. Some of these booklets, including The Abacus Made Easy and Using the Cranmer Abacus for the Blind are available as a free-of-charge print or braille file downloads from our downloadable manuals page at www.aph.org/manuals/index.html. The Cranmer Abacus was the first abacus that APH developed, but over the years, based on suggestions from the field, we have developed several other adaptations of this tool to address specific needs. APH currently also provides the Beginner's Abacus with only two rods of 9 beads, the Expanded Beginner's Abacus Kit with three rods of 9 beads, and the Large Abacus, which is an enlarged version of the Cranmer Abacus designed for younger students and those without fine motor skills. And, while we certainly love our "oldies but goodies," there is now the new EZeeCOUNT Abacus which consists of a 10 x 10 grid of flat beads that can be flipped and distinguished by color or texture. The Shape Board has been revised! Learn to discriminate, sort, and classify different geometric figures according to size, shape, color, or position on a pegboard. This board has proportional shapes that contrast brightly against the yellow pegboard and aids in understanding the concepts of up, down, right, and left. This product consists of 25 geometric figures and a board with three columns of five pegs. It includes five different shapes (square, rectangle, triangle, circle, and pentagon) in small, medium, and large sizes. Instructions in print and braille are also included. The Prevocational Skills Development Materials Kit was designed to help multiply disabled students develop manipulative skills, such as matching, sorting, counting, assembling, and packaging. The complete kit contains five sets of materials and a print guidebook. Each set of materials is also available as a separate purchase. The kit includes a Paper-Folding Jig for tri-folding 8 1/2 x 11 inch paper. (APH also carries the FoldRite: Letter Folding Tool to assist with this task.) The Round and Square Containers with Screw Tops includes 10 plastic bottles of graduating size and two seated boards. The Bolt, Nut, and Washer Board includes eight bolt, nut, and washer sets of graduating size. The Bolt Practice Boards includes four boards mounted with bolts and nuts of various sizes. The Sorting and Assembly Tray comes with adjustable dividers for sorting two to twelve different items. Like many APH products, some parts of this kit can be used in additional ways, making them useful beyond their original purpose. For instance, the Sorting and Assembly Tray can also be used as a calendar box system. Calendar boxes are used to teach daily schedules, improve communication, and develop the concept of time. Each divided section represents a specific period of time and an object placed within that area represents an activity to be worked on during that time period. APH's Sorting and Assembly Tray is especially useful for this purpose because it is durable and can be expanded from just one or two activities per day to a more advanced calendar box by simply adding additional green dividers. The Hundreds Board and Manipulatives Kit includes two desk-sized boards made of heavy-duty plastic. The Grid Board has a raised-line, 10 x 10 inch grid outlined in black. The grid is blank and manipulatives can be attached to it. The Number Board also has a raised-line 10 x 10 inch grid outlined in black which is preprinted with the numbers 1 through 100 in large print and in Nemeth Braille. This board acts as a reference to check work placed on the Grid Board and can be used for concept demonstration. Also included with the kit are hundreds of manipulative pieces made of tough plastic and backed with hook and loop material for attaching to the Grid Board. There are two kinds of manipulatives included: numbers (1 through 100) and colored shapes (circles, squares, triangles, and stars). Watch a teacher and student-made video showing how the Hundreds Boards can be used to make learning math concepts into a fun activity. This video was one of the many wonderful videos that have been submitted as part of APH's Unforgettable APH Star Contest. For information on how to submit your own video of an APH product, please review the official rules of the summer 2013 contest. Anyone can enter to win cash prizes of up to $150! The Quick Pick Educational Game Series provides a unique play format for students who are visually impaired and blind. Each Quick Pick title consists of a set of cards packaged in one or more plastic cases and includes a wooden tool. Each game card presents a question or other challenge with four possible answers. The student reads the card while it is still in the case. To play, the player chooses an answer by inserting the wooden tool in one of four holes in the front of the case. If the answer is correct, the card will slide out of the case. If incorrect, the card will not pull out, and the player should try again. The object is to “quick pick” as many cards as possible on the first try. This fun and challenging flash card game can be played at school, at home, or in the car. Quick Pick Braille Contractions includes two cases of 50 cards with each case representing a cross-section of braille contractions. On both sides of the cards, a braille contraction is on the top and four uncontracted answer choices are across the bottom. Quick Pick Math is available for addition, subtraction, multiplication, and division. Each set consists of one case containing 50 large print/braille cards. The front and back of each card contains a math question and four possible answers. Quick Pick Counting is designed to help children learn to count to 12 with raised-line symbols and braille numbers. It includes 50 one-sided game cards. The player counts the tactile symbols and then reads the correct braille number. The raised-line symbols are embossed only; the number answers are large print-braille. Teacher's Pet™ is an accessible test creation and administration program. This software can be used by parents, teachers, or others who wish to create accessible practice exercises or tests for students who are blind or visually impaired. This program allows the creation of both audio and large print tests or practice drill sessions. Teachers benefit from the program's student management and record keeping capabilities and can use it to track student progress. The program provides a rich environment for creating or editing the pools of questions that comprise the test or drill document. Students interact with the program to provide responses, review answers, or browse through the set of questions. Questions include text, graphics, and sounds to help make the test or drill session more interesting. The Analog Clock Model helps teach about time-telling concepts. It has braille and raised large print markings and hands that are easily rotated. This clock has no motor. Teachers and students can easily rotate the hands of the clock which are synchronized like those of an actual clock. To help reinforce concepts of time, you can also use the Clock Face Sheets in Braille. Each sheet contains four embossed braille clock faces. Hands can be added to these blank clock faces using a variety of methods. The worksheets can be used for both instruction and assessment purposes. Kristie Smith-Armand has written an article entitled Time Passages for Children Who are Blind that provides some teaching suggestions using these, and other, materials. This article is featured in the Fred's Head blog, an APH resource that contains many tips, techniques, tutorials, in-depth articles, and resources such as this that are written for and by blind or visually impaired people. We encourage you to explore the blog for more useful information. The Swing Cell Compact is a smaller and lighter version of the older Swing Cell that had a base. It is used to introduce braille, practice dot numbers, and to help students understand the relationship between the braille cell and the keys on a braillewriter. Black pegs are used to represent the dots in a cell or the keys on a braillewriter. When the device is in the reading position, two rows of holes are parallel to each other and perpendicular to the user’s body, with the hinge at the top of the device. When the device is in the writing position, two rows of holes are adjacent to each other in a line parallel to the user’s body, and the hinge is at the bottom of the device. Hook-and-loop material is used to hold the device securely in either position. This product comes with twelve pegs. When not in use, six pegs can be stored in two holes that are in the center of the wooden blocks. Storing the device in the writing position will keep the pegs from falling out of the device. The included adhesive foam backing can be applied to the bottom of the device to help keep the device from sliding during use. Do you currently own a Braille+™ Mobile Manager? Simply snap the Braille+ into the Docking Station and you have a highly functional, comfortable-to-use, portable notetaker. Smaller than a laptop computer, the QWERTY Docking Station provides netbook-like functions, including connectivity and comfort on-the-go. The Docking Station enables you to take notes comfortably with a full-size QWERTY keyboard, perform full-capability word processing, browse the Web extensively, and read and write email. The Docking Station is designed to be large enough for your hands to rest comfortably with its foldout hand rest, yet small and lightweight so it's easy to carry along. With long-lasting batteries, you can dock-in and power on. Charge your Braille+ by plugging it into the docking station, even if the docking station is not plugged in. With an Ethernet connection you can log into your office network or the internet, and with USB host and client ports, it is easy to hook-up peripherals. Note: The Braille+ Mobile Manager, which has been discontinued, is required to operate the QWERTY Docking Station. The QWERTY Docking Station is currently on sale for $500, which is $100 off the original price. Other related items which are on sale and available for a limited time only are the Braille+ Leather Carrying Case, QWERTY Docking Station Leather Carrying Case, as well as the AC-DC adapters and rechargeable batteries for both devices. Touch and Tell is a classic set of braille reading readiness books consisting of three volumes with tactile pages. These books were designed to help meet reading readiness needs of students who are blind or visually impaired. Volume I introduces square, circle, and triangle shapes, and the concepts of size and number of the shapes. Volume II builds on to these concepts and adds the concepts of difference and alikeness, as well as location on the page (over and under, left and right, etc.). Volume III continues to build on all of these same concepts while introducing braille dots. There are 16 tactile pages in each volume. The book has been divided into these three smaller sections for ease in handling by small hands as well as to minimize the time needed to complete each section in order to give children a chance for early and happy success. This product is available with Federal Quota funds. The Touch and Tell Instruction Booklet offers suggestions for discussions and activities that may be used in conjunction with these books. The instruction booklet is available as a free APH Downloadable Product Manual. APH has two available calendar kits recommended for use by students ages 4 through 10. Both of these products are available with Federal Quota funds. The Classroom Calendar Kit contains a large wall calendar which introduces sighted and blind children to such concepts as measuring time; tracking left, right, top, and bottom; recording the weather; and recognizing and sequencing numerals. This kit includes a blue plastic month grid, large print/braille labels with an orientation corner cut (yellow labels for the year, month, and days of the week; white labels with numerals 1-31; and brightly-colored and embossed holiday and weather symbols). The instructions are provided in large print and on CD-ROM. This product is available in both English and Spanish. The Individual Calendar Kit allows students to experience the fun and challenge of creating their own calendars. These calendars are inexpensive and consumable. The kit includes twelve brightly-colored embossed/bold line grid sheets, and paper labels showing the month, days of the week, and days of the month. Labels are marked in both large print and braille and are marked with an orientation corner cut. PLEASE NOTE: Consideration is being given to modernizing these calendar products. If you have any suggestions or ideas that you would like to share, please send them directly to Burt Boyer, APH’s Early Childhood Project Leader, at bboyer@aph.org. Teaching the Student with a Visual Impairment: A Primer for the Classroom Teacher (TSVI) is a practical manual designed to assist the classroom teacher, parents, and other adults who teach the student with low vision. This guide addresses the unique sets of challenges found in educating the student with low vision and primarily focuses on the all-inclusive classroom for students K-12, but also contains some applications for homeschoolers. Rich in facts and tips, TSVI guides the reader in how to prepare for the unique educational needs of the student with a visual impairment. TSVI also provides an extensive listing of agencies and organizations that serve persons with visual impairments. What Can My Student See? How Can I Know My Student's World? This product is available with Federal Quota funds. TSVI includes a tote bag and consumable materials. The consumable materials include several useful interviews, observation forms and checklists. These are to be completed by teachers, parents, and students and used in conjunction with the manual. The product manual is available in PDF format as one of APH's many FREE downloadable product manuals. The accompanying consumable materials pack may be purchased separately. The first product that we would like to revisit with you is the DRAFTSMAN Tactile Drawing Board which was first produced in 2005. 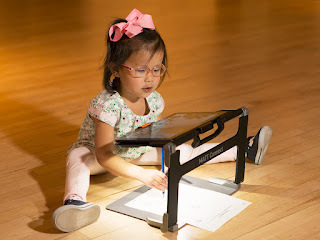 This product is a versatile tactile drawing board that is used in combination with special film and a stylus to create raised-line drawings instantly. It is intended for a wide audience, such as visually impaired students, teachers, parents, and adults, and can be used in a wide variety of situations, whenever a simple raised-line drawing is needed. APH Tactile Graphics Project Leader, Karen Poppe has created a PowerPoint presentation (.ppt)to provide further information about this product. This information is also provided in a text-only format. This video clip, http://www.aphmedia.org/video/draftsman.avi, demonstrates exactly how to prepare the DRAFTSMAN for use. Reclaiming Independence: Staying in the Driver's Seat When You No Longer Drive is a product developed by Penny Rosenblum, Ph.D. and Terrie Terlau, Ph.D., released in 2007. This kit includes a large print resource guide, a cassette recording of the resource guide, and a DVD or VHS video. The 45-minute video follows six older persons, who stopped driving because of vision loss, as they continue to lead active, independent lives. These individuals discuss issues such as dealing with loss, and finding low vision, rehabilitation, and transportation resources that allow them to become successful non-drivers. The accompanying resource guide provides information about understanding visual impairment, services for adults with vision loss, transportation options and strategies for using them successfully, and finding resources that work. This product can offer people with low vision and their families validation, role models, information, examples of positive outcomes, and hope. The link below will allow you to watch an 8-minute complimentary preview trailer of the video. If you know of anyone who might benefit from receiving a DVD copy of this complementary preview along with an informative brochure, we do have a limited supply available. Please contact Terrie Terlau at tterlau@aph.org with their mailing information. The Card Chart Kit holds the 3 1/2 x 2 inch braille/print cards sold by APH. The chart board measures 19 1/2 x 12 1/4 inches and has holes for hanging and a corner cut for orientation. Up to five cards can be inserted into each of the six high contrast slots. The kit includes 90 blank cards. Additional blank cards may be purchased separately and several sets of prepared cards are available for purchase. The Expanded Dolch Word Cards consist of 220 sight vocabulary words and 95 words with pictures. These cards can be used for reading practice or an informal assessment of a student's ability to read words in contracted braille and to spell words in uncontracted braille. Words are shown in contracted braille on one side and uncontracted braille on the other, with large print on both sides. Braille Contraction Cards are large print/braille flashcards that can be used for practicing the Literary Braille contractions. This set includes the alphabet and numbers, punctuation and composition signs, two-cell contractions, one-cell whole-word and part-word contractions, and short-form words. There are 247 cards in this kit. The first 26 cards contain the braille alphabet on one side and large print on the other side. Remaining cards contain contracted braille on one side and both uncontracted braille and large print on the other side. The Math Drill Cards that are available for use with the Card Chart Kit include Number & Math Signs, Addition, Subtraction, Multiplication, and Division. The cards in the Number & Math Sign set have a math sign or number sign in braille on one side and large print and braille on the opposite side. Large print/braille math operations cards have a math fact on one side and the fact with the answer on the opposite side. These cards are done using the Nemeth Braille Code for Mathematics. Geometry Tactile Graphics Kit is a set of thermoformed raised-line drawings depicting geometry concepts, figures, and relationships which are covered in nearly all geometry textbooks. The graphics in this kit, however, are larger and easier for students to measure than those in most braille textbooks. They are intended to supplement, not replace, the graphics in a student’s adapted textbook. This kit includes 26 white plastic thermoform sheets measuring 8 1/2 x 11 inches (52 drawings total), two specially adapted protractors, a teacher's guide in print and braille, and a storage binder. The protractor itself has several unique features, designed specifically for use with the graphics in this kit, which make it easier to use than an adapted commercial model. The teacher’s guide provides specific instructions about the recommended procedure for using the protractor, as well as a description of each drawing and instructional hints for teaching each concept. In the PowerPoint that follows, you can see the line drawing of each graphic provided in the kit. Note: The black line drawings shown are not included in the kit, only the thermoformed graphics, but each line drawing is currently available for download from the Tactile Graphic Image Library. Download the Geometry Tactile Graphics Kit PowerPoint. Fine Motor Development Materials Kit: Twist, Turn, and Learn was designed to help young children who are visually impaired or multiply disabled in developing and refining fine motor functions. Fine motor activities encourage the development of eye-hand coordination and help children practice the skills required to handle or manipulate small objects with their fingers. The eight specially designed modules included in the kit assist students in developing such skills as reaching, grasping, raking, pincer grasp, wrist rotation, searching technique, palmar grasp, and visual-motor/visual-perceptual coordination and attract the child's attention with bright colors and ringing bells. The modules nest together for convenient storage in a durable carrying bag. Also included is a set of straps designed to allow the modules to be hung on playpens or cribs. This product comes with a teacher’s guidebook that contains ideas and suggestions for utilizing the modules. This PowerPoint provides photographs and a brief explanation of each module. The Brannan Cubarithm Slate is a rubber slate with a 16 x 16 grid pattern of nests which will hold small 3/8" plastic Brannan Cubarithm Cubes which are placed in the squares of the frame. Slate and cubes are sold separately. Each cube represents one digit and are numbered 0 through 9 in braille (no print). The cubes are available in a set of 100. Young students may find it easier to use this slate and cubes, rather than a brailler, to align problems such as multiplication. The Brannan slate was designed by R.E. Brannan of Summit, New Jersey. Brannan turned over his rights to the invention to APH. APH began manufacturing the Brannan Cubarithm Slate and Cubes in 1957. Directions for how to use this device are available on our Fred's Head Blog. Photographs of the device and the mathematical equations described in the blog can be viewed in this PowerPoint. The Everyday Exposure to Experiences for Enjoyment Calendar, also called the Everyday Activities Calendar, was written by Nancy Smith, a Wisconsin state-wide consultant for children who are blind or visually impaired and produced by APH in 2001. It is an idea-filled calendar that suggests a fun preschool activity for each day of the year. The calendar was designed specifically for young (ages 3-8) visually impaired children, but all children may benefit from and enjoy participating in the activities. The activities are drawn from everyday occurrences in a child’s life and make use of easily accessible, low cost materials typically available in the home. The large print/braille calendar comes in a three-ring binder with a colored dividing page between each month. The calendar is formatted with two days per page. This calendar does not track any specific year, and can therefore be used year after year. The introduction for this product includes detailed task analyses of washing the dishes and of crushing crackers for meat loaf stuffing. These are provided in order to demonstrate examples of how to break an everyday experience down into the smaller steps that make up the experience. Because visual impairment results in a deficit of learning through visual observations and it is necessary to use a multisensory approach that takes advantage of the child’s remaining senses. Activities may need to be broken into smaller segments and repeated multiple times. It is not required that every activity in the calendar be completed, but rather, the calendar is meant to be a compilation of ideas from which to draw inspiration and expand upon. The calendar is designed so that the user may begin at any point and choose activities appropriate for the child, the occasion, and the lifestyle of the family. Cross-environmental teaching is encouraged and activities may be taught by a variety of different “teachers” and in a variety of locations. Listen and Think is a classic product to develop and improve listening comprehension and thinking skills. Listen and Think was originally released in print in 1968 and was adapted by Eleanor Pester and first sold by APH around 1987. In 2009 the listening materials began being produced in CD format when the audiocassette editions were discontinued. Listen and Think Auditory Readiness (AR) Level (5-7 years) includes 15 lessons and covers basic listening skills such as understanding positional placement (e.g., up, down, behind, between, beside, etc. ), comparing, classifying, cause and effect, sequencing, and predicting outcomes. The AR level includes an introduction and lessons on CDs, a print teacher's handbook, simple multiple-choice answer sheets, and crayons. Advanced levels Listen and Think Level B (7-8 years) and Listen and Think Level C (8-9 years) introduce such concepts as main ideas, summarizing, outlining, and comparing. Level B and C each include introductory material and lessons on CDs, a print teacher's handbook, braille and large print multiple-choice answer sheets, braille and large print progress charts, crayons and marking pins. Each lesson presents a recorded passage to the student which introduces various concepts. At the end of each passage are recorded questions that the student can answer using the provided crayons and simplified answer sheet. The correct answers and necessary explanations are provided on the recording as well so that these lessons can be completed independently, in small groupings, or with the entire class, providing flexibility for the teacher. Within the Teacher’s Handbook are additional questions and activities that can be used for follow-up reinforcement and to further extend the concepts presented to the curriculum areas of Language Arts, Social Studies, Science, and Music. Money Handling and Budgeting is a collection of techniques and resources for teaching adolescents or young adults who are blind and visually impaired the skills necessary to manage money in daily life. This guide is based on the premise that daily living skills must be learned in natural settings and with real-life applications whenever possible. A variety of fundamental, interconnected skills are addressed in this product, including: coin and bill identification; counting money and making change; budgeting; basic employment strategies; banking skills; and handling money in a number of simulated and actual daily living situations, such as visiting a store or a bank. Appendices include a glossary, references, resources, an aids/devices chart, and a record keeping skills chart. Included with this product is an adapted practice checkbook with a vinyl cover; a pack of 28 yellow, raised-line, large type practice checks bound with 8 white, raised-line, large type practice deposit tickets; and a white, large type, columned practice checks and deposits register. The resource guide, along with the adapted practice checkbook, helps students learn vital money handling skills. O & M Tactile Graphics is a tool for helping teach orientation and mobility concepts such as compass directions, clock locations, and navigating outside and inside. It contains 10 high-contrast print/tactile graphics and a teacher's guide in print and in braille. The teacher's guide gives you basic ideas for lesson planning using the graphics, suggested concepts, and instructional hints for each graphic. The Chang Tactual Diagram Kit is made up of a board covered with black hook/loop material and over 100 VELCRO® brand-backed geometric forms in 27 shapes and sizes, which allow for a wide variety of concept development activities. This versatile tactile aid allows for instruction in orientation and mobility concepts as well as other curricula areas. The Chang kit is easy for young children to manipulate and has a pleasing texture. The stick people that are included have different left and right hands and the face is only incised on one side of the figure. This allows these figures to be used to mirror left-right relationships. They can also simply add an element of play to the lessons since they can be used to navigate the layouts that are created by the student. Time for Art: Art Projects and Lessons for Students with Visual Impairments is a handbook for teachers and parents that explains how to instruct visually impaired students in art, how to handle the media being explored, and points to consider in art program planning. Time for Art consists of a regular print guidebook and a CD-ROM containing an HTML edition of the guidebook, accessible to visually impaired users. Each project includes objectives, a list of needed materials, the step-by-step instructions, and a companion lesson that often explores other curriculum areas such as science, history, or mathematics. A comprehensive list of suppliers is offered at the end of the guidebook to aid teachers and parents in finding materials for the projects. Instructors may want to consider using Time for Art as they work with students who are interested in submitting art work for the annual APH InSights art contest. For more information on this contest, visit the APH Museum website. The Tactile Treasures Kit unlocks the treasures that make learning math and language concepts fun for young children with visual impairments. Tactile Treasures is an informal assessment and teaching tool for use with children from preschool through elementary school. It helps develop an early understanding of basic concepts and vocabulary that are prerequisites for reading and math. By pairing the tactile graphics of thermoformed real objects with included descriptive scripts/stories, over 90 concepts related to shape, size, comparison of two or more objects, amount, position, and page orientation can be introduced and reinforced. Tactile Treasures is packaged as a complete kit consisting of three individual binders housing a total of 79 white thermoformed sheets, measuring 8 1/2 x 11 inches, and a teacher's guidebook (both print and braille versions provided) with two suggested scripts or stories for each concept introduced. The guidebook also gives a general overview of the materials, instructions for use, and extended activities. The types of thermoformed objects are numerous: from pretzels, buttons, and rings to zippers, scissors, and shells. The variety of objects depicted adds interest, encourages exploration, and helps broaden vocabulary. Parents And Visually Impaired Infants (PAVII) is a comprehensive set of print materials designed to help parents of visually impaired infants become engaged as primary members of the intervention team and become deeply involved in their child's education. The project authors are Deborah Chen, Clare Taylor Friedman, and Gail Calvello. These materials were created as a part of the three-year PAVII Project of the Blind Babies Foundation. The main objectives of the Project were to facilitate the parent's role as primary interventionist and to develop strategies which are ecologically valid and age-appropriate. These materials were first made available by APH in 1989 and are available for purchase using federal quota funds. Parent Assessment of Needs: This is an ecological inventory which helps parents identify and prioritize home-based goals for infants. Parent Observation Protocol: This section provides direction for using video recording to encourage parent observation of self and child and identifies teaching strategies for facilitating early learning experiences. PAVII 'How-To' Papers on Assessment: This is a series of papers for home-based assessment which includes an "Overview of Assessment," "Identifying Visual Impairments in Infants," "Functional Hearing Screening," "Assessing Infant Communication," "Assessing Interaction with Objects," and "Developmental Assessment." The Art of Home Visiting: This section discusses the responsibilities of a home visitor and issues encountered in the home visit process. Getting Ready for School: This section outlines the learning environment, family factors, child factors, school district factors, expert input, and educational rights. Learning Together: A Parent Guide to Socially Based Routines for Visually Impaired Infants: The final section (also available separately) offers home-based strategies for helping parents decide which areas need work and for helping an infant learn during everyday activities. By adding braille embossing to your business cards, you will not only make your contact information accessible to braille readers, but you will also be leaving a lasting impression on the community at large. The Impressor is a braille business card embosser available from the American Printing House that is similar in design to the stamp used by notary publics. The labeler is made of metal with an acrylic base for one-hand operation. The metal die, which embosses braille on your card, is custom-made with your information. You can emboss up to four lines of braille with 13 braille cells per line onto a standard 3.5 x 2 inch business card. Insert a business card into the embosser, squeeze the handle, and your card is brailled instantly! Business card information is customized at the time of ordering, and can be easily revised later for an additional fee. Please note that this product requires special handling and cannot be ordered online. Please call us at 800-223-1839 to initiate your order. This product is not available with Federal Quota funds. Please keep in mind that while APH strives to give you products that are timeless and durable, some of the materials that we use will eventually show signs of age. Please always inspect products—especially older products that may have been sitting unused for a period of time—before use, to ensure there are no signs of breakage or loose parts that could be dangerous for small children.